We went to see Aidan and we were greeted with a note on Aidan's Crib. 1.8cm left to grow! We had asked the doctors here to look at his xrays and were guessing at how much left he had to go but it's much better getting it from Kirsti. 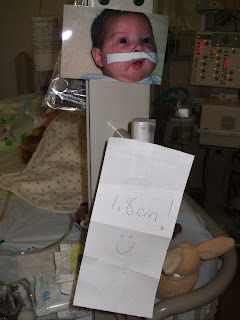 The Doctors in charge of Aidan in the PICU put him on another diuretic because he is gaining too much water weight and looks quite puffy hopefully he won't continue to retain so much water. Kirsti stopped by and left us a note. 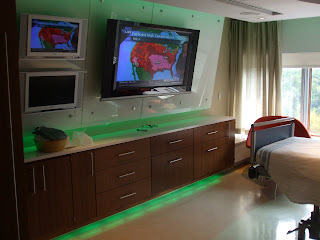 The Children's Hospital is trying to merge the Riverside and Fairview Children's Hospitals into 1 building in 2010 so to show off the new hospital rooms they have "Adopt a Room". 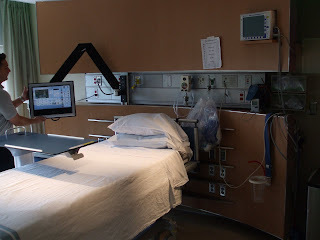 They are technology previews of the rooms the new hospital will have. The rooms are setup to get corporate sponsors to adopt. Who wouldn't want to stay in these rooms! The remote for the TV wall / Lighting / Music. I'm so happy that the esophagus pieces are getting closer. He'll be getting connected really soon. I keep praying for Aidan & Laura & Mike.